Although our AMIGO may seem compact, this pocket cruiser offers the seaworthiness, comfort, and features of much larger vessels, but at an affordable price. Not to be confused with the lighter, less able weekender-types of similar length, this is a heavy boat capable of serious long-distance offshore and coastal cruising. 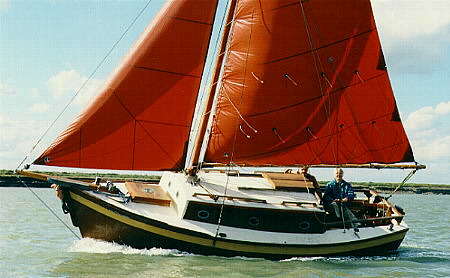 Yet AMIGO is a boat that is easy to handle in either the masthead or gaff sloop rig, even by the single hander. Best of all, it's trailerable. A most notable feature aboard AMIGO is the standing headroom throughout the cabin area, a remarkable feat considering the very attractive and well-proportioned appearance. Another clever feature is the fully enclosed toilet room with stall shower formed by a series of hinged panels. These panels fold back when not needed, hiding the head from view while opening up the cabin for spaciousness. The divided cabin offers dual cabin privacy, something seldom seen on a 22' boat. Other features of AMIGO include two hanging lockers, a dinette that converts to form a berth, an aft quarter berth, a 4' long galley, and a huge ice box with loading and access from the cockpit or galley. Storage space is located in every nook and cranny, including a separate locker at the stern for stove fuel with overboard drains for safety. The cockpit is self draining and long enough to sleep in. For range there is a 50 gallon fresh water capacity. Aimed at the amateur who prides himself on quality workmanship and perseverance, building AMIGO will be a rewarding experience that will draw the admiration from on-lookers. Plans are available for either wood-strip or "one-off" fiberglass construction.